EMBRACING HOUSING AS A PILLAR IN THE BIG 4 AGENDA. By Phoebe Chirchir and Evans Kipchumba. Quality and affordable Housing is one of the big four agenda in the National Government’s initiatives to be implemented through the extensive development of policies and projects that directly impact the lives of the ordinary citizens. Article 43, sub-article 1(a) of the constitution of Kenya guarantees every Kenyan right to accessible and adequate housing, and to reasonable standards of sanitation. 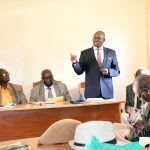 The state Department of Housing and Urban Development has therefore been charged with the mandate of structuring and delivering the affordable housing programme covering major urban areas across the country. The government of Kenya has budgeted 6.5 billion shillings for the same and this is achieved by incorporating innovative, cost effective and efficient delivery models through the effective use of affordable and environmentally friendly construction materials as well as efficient construction techniques and technologies. The County Government of Nandi is realigning its efforts on the Big Four agenda by focusing on housing as one of the pillars to it development plans. This is aimed at achieving the low-cost housing objective for the citizens as a way of solving the problem of inadequate and poor housing which is brought about by unavailability of affordable housing, challenges linked to land ownership and high cost of construction. 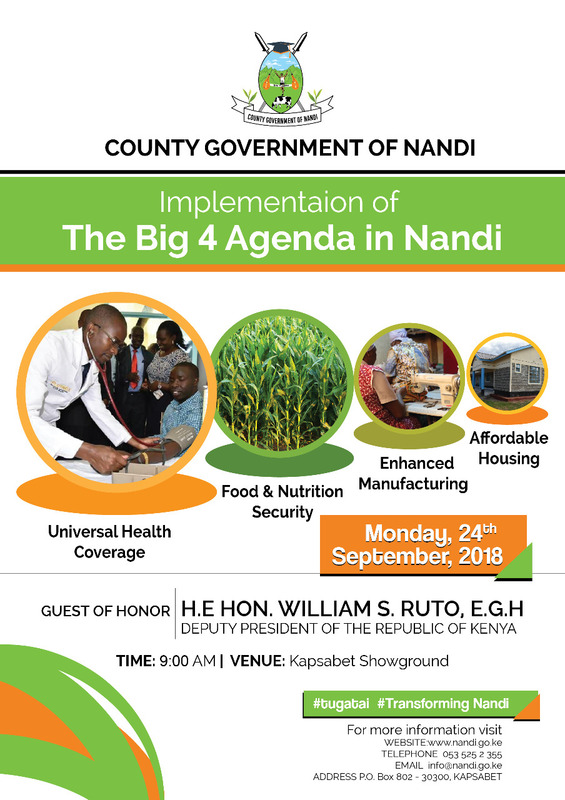 Therefore, the County Government of Nandi plans to have in place 5000 houses across the County through partnerships and development partners) in order to reduce congestion, improve security and environmental conservation, improve health and sanitation, enhance better quality of life and to meet the ever-growing demand. 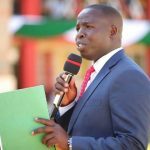 To meet this target, the County Government of Nandi hopes to forge strong partnerships with financial institutions, private developers, producers of building materials and more importantly, National Government. In order to realize the 5000 houses in five years it is aimed at bridging the existing deficit of approximately 100 units per year. The County Government will also be seeking funding opportunities from development partners and from National Government to augment the existing financing mechanisms that are being put in place to spur economic growth arround the housing sector and additionally create alternative financing strategies to promote investments in low-cost housing and related social and physical infrastructure. There are strategies put in place for the achievement of quality and affordable housing by the county government and will be realized by developing the physical development plan, review of the land tenure system, sensitization of policy makers and other stakeholders, acquisition of land for the construction of the affordable housing units, developing funding proposals for construction of housing units, identification of development partners, construction of the housing units and establishment of tenant purchase schemes. 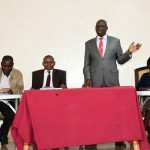 To hasten the realization of these achievements, the county government through the department of Lands intends to fast track the spatial planning of the Entire County, Department of Administration, Public Service and e-Government is undertaking Integrated Urban Development planning for Kapsabet and Nandi Hills as well as allocating funds in the budget estimates of 2018/19.